George Harrison's Country Gentleman came with the Filter'Tron Pickups. But the fact is he used his Tennessean with the HiLo'Trons much more. 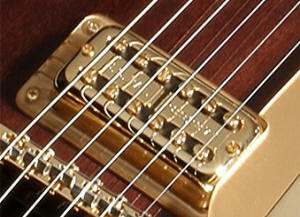 "Bigsby Vibrato Tailpieces Provide Exciting Tonal Effects!" 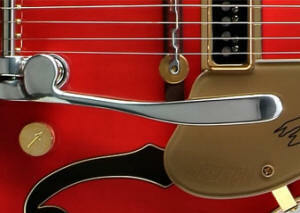 Bigsby vibrato tailpieces have been available on Gretsch guitars since the '50s. Their classic design allows guitarists to add beautiful tremolo and pitch-bending effects to single notes or full chords – while keeping the guitar perfectly in tune. 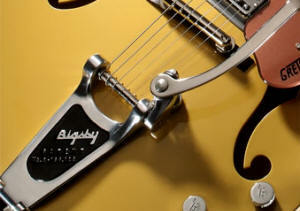 Sometimes called a "Fixed Arm", the Bigsby stationary handle is fixed in one position, moving only up and down to create the vibrato effect. Also known as the "C.A." 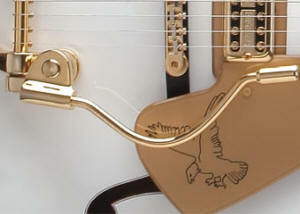 handle or "arm", the Bigsby Wire handle is preferred by many Gretsch players. Plus, it just looks so darn cool! Also available in a Stationary configuration. 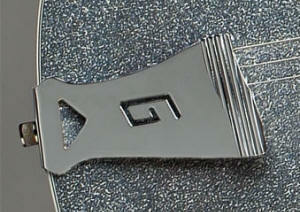 The G-cutout tailpiece is seen on most Country Clubs and Anniversaries, as well as some Jet models. 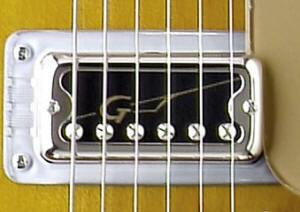 This simple, stamped brass design has become somewhat of a Gretsch hallmark, and is still used on most non-vibrato equipped Gretsch's today. 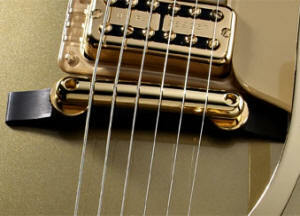 Billy Gibbons uses this tailpiece on many of the custom guitars & Gretsch guitars he owns. 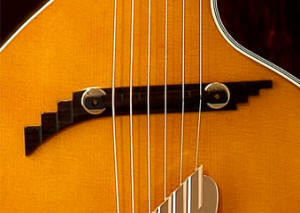 The Synchromatic 400 "Chromatic Tailpiece" is an exclusive Gretsch feature. The tailpiece is designed to compensate for differing string gauges, thereby reducing tension and equalizing playing finger pressure. 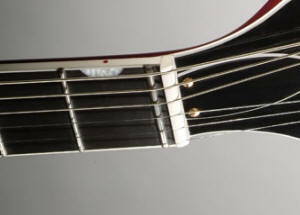 The tailpiece makes playing easier with uniform finger action. Epiphone offered their Frequensator tailpiece on some of their early Riviera models. A hallmark feature of the Gretsch Falcon ™ and Penguin ™ models, the hand made "G-Cadillac Tailpiece" symbolizes grace and elegance. 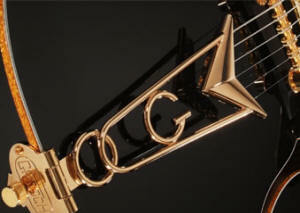 We are using this Tailpiece on our own Abstract Custom Guitar called the Cadillac. First introduced in 1951, the Gretsch Synchro-Sonic Bridge produces perfect intonation in all registers by means of moveable string rests. Each string is allowed to find its own true octave and true intervals in all positions. All strings can be accurately tuned and locked in place. No screwdriver needed! 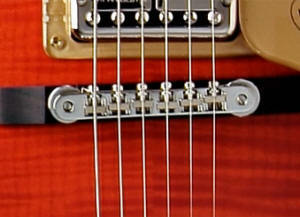 The Synchromatic "Synchronized bridge" is another exclusive Gretsch feature. The bridge is graduated to provide progressively broader contact between the vibrating strings and the top, or sounding board. The result is perfect harmonious balance between the fast vibrating treble strings and slower vibrating bass strings. This is a very art deco complement to the guitar, everyone who sees it assumes it's a cosmetic thing. This really works though. "With the new GRETSCH SPACE CONTROL BRIDGE" the guitarist can for the first time space his strings to suit every style of playing." No fuss, no muss! 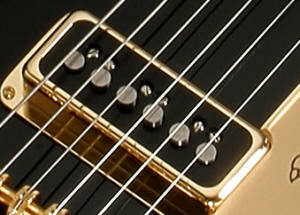 A long time favorite among Gretsch players, the Gretsch Bar bridge produces a smooth glassy tone with enhanced sustain. 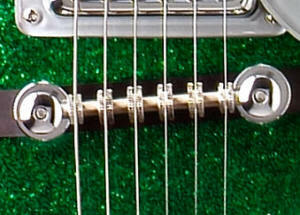 The updated version of the classic Gretsch Bar bridge features cone shaped post holes allowing the bar to "rock" back and forth when a Bigsby Vibrato is used. Not recommended by Ed Roman, I would prefer to be able to intonate my guitar. 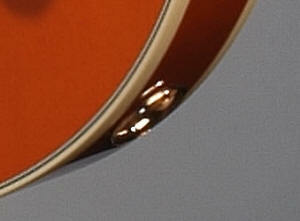 I think that's a little more important than getting a smooth glassy tone on a hollow body Rockabilly guitar!! 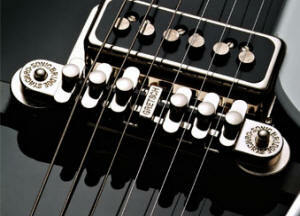 The Adjusto-Matic bridge offers great tone and precise intonation with its six individually adjustable string saddles. When used with a Bigsby vibrato, the bridge slightly "rocks" with the movement of the strings- reducing friction and adding tuning stability. "Now here's a bridge I can get behind, This is like a Gibson Tune-o-Matic but I don't have to say It's a Gibson part." Introduced in 1962 to help reduce unwanted feedback while playing at louder volumes, the Electrotone hollow body is typically 2" in depth, and has simulated F-holes. "Centuries ago, when string instruments were first built, the early craftsmen discovered that pure ebony offered the best basic board for playing performance. As time passed, instrument makers began to decorate these fine playing boards with fancy pearl inlays which were beautiful but in no way helped the playing performance of the board; it only destroyed the wonderful feel only pure ebony could give. It is with these proven facts in mind that we introduce the new Gretsch Neo-Classic fingerboard—the finest in playing performance and sheer beauty. The beautifully inlayed half moons (thumbnails) on the bass side of the board are perfect position markers and do not in any way detract from the classic feel which is so essential to perfect performance. 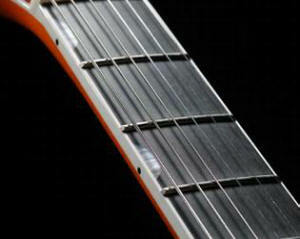 Neo Classic construction preserves the full strength of the fingerboard." 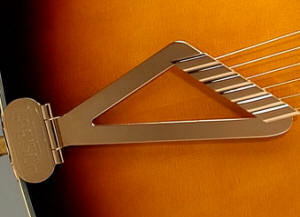 Introduced in 1959, the Action-Flow Zero Fret Nut allows you to play at fret level from one end of the fingerboard to the other. No more string nuts that are too high or too low! As a return to original specs, the Electro-Socket recessed metal jack dish is once again featured on Jet style solid body guitars.